Coming off of a trying season in which he did not meet expectations, Luis Severino should still be considered one of the Yankees' top prospects (though for statistical purposes he can no longer be considered a prospect) entering the 2017 season. Despite maintaining his top "prospect" status, Severino will have slightly different expectations entering this year’s campaign. Severino is one of several Yankee pitchers engaged in a battle for two spots in the starting rotation, but even if he does earn one of those spots he will then have to prove that he can be a reliable major league starter, something that has proved elusive to Severino in his major league career thus far. After flying through the system in 2015, Severino made a cameo in the starting rotation towards the end of that season, making 11 starts and pitching to a 2.89 ERA. Coming off of that encouraging performance, Severino entered 2016 as a member of the rotation and did not yield the results that everyone was hoping for. Severino made 11 starts over the course of the 2016 season and posted a disastrous 8.50 ERA. He also missed time in May and June with a strain of his right triceps. Arm injuries are always concerning for pitchers, especially for young power pitchers. Later in the season, Severino was able to come back and pitch effectively out of the bullpen pitching 23.1 innings as a reliever and posting a 0.39 ERA. Overall Severino ended his roller coaster of a season with a 3-8 record and a 5.83 ERA in 71 innings pitched. Despite his stellar numbers in relief he still posted an unsightly 1.451 WHIP and allowed 78 hits in those 71 innings which is a rate that needs to be reduced if Severino hopes to become an effective starter. Altogether these numbers don’t tell the full story for Severino’s 2016 season. If you watched him pitch in relief you saw a confident pitcher dominate major league hitters night after night. Unfortunately if you watched him as a starter you saw almost a totally different pitcher, one who struggled to navigate lineups and put away batters despite wielding a potent arsenal. Even with all of these struggles, Severino and the Yankees enter the 2017 season with renewed hope that he will become an effective major league starter. Tasked with having to truly earn his spot in the major league rotation, Severino entered this spring with an increased focus on pitching instead of just throwing. He brings to the table a blazing fastball that sits in the high 90s, a sharply breaking slider that is often his put away pitch and a changeup that he is working hard to develop and incorporate more into his mix. A third quality pitch is often looked at as a key to being an effective starter, so how he develops that changeup may be just as important to improving as the command of his other offerings is. Overall, Luis Severino has been through a lot for a kid who just turned 23 a few weeks ago. In spite of those ups and downs, Severino still has confidence in himself and is working hard on keeping calm and focused on the mound. It is another important step in the maturation of a kid who the Yankees still believe can become a front of the rotation starter someday. 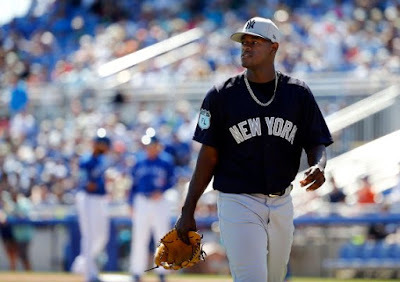 It would be a big boost to this years’ Yankee team if Severino were to step forward and seize a spot in the rotation; however, if the team feels he is still not ready, it is possible that they send him down to Triple-A so he can keep working on putting it all together as a starter. No matter what happens, Yankee fans will surely be seeing a lot of Luis Severing in pinstripes this season. We can only hope that we will see a new and improved version.